40 stands enliven the cheap bazaar held at East Jakarta Mayor office, Thursday (5/24). There are many basic needs and clothes sold in affordable prices.
" 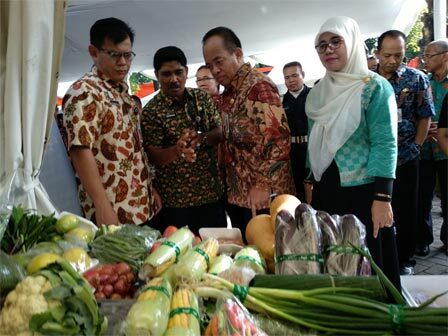 I hope employees and local residents can take a chance to visit this bazaar"
East Jakarta Mayor, Bambang Musyawardana said, this bazaar is participated by small medium enterprises and coached merchant from OK OCE program. "I hope employees and local residents can take a chance to visit this bazaar. No need to worry to run out of goods because we will hold this bazaar twice which is today and early June," he informed. Meanwhile Central Jakarta Economy Section Head, Yeni Asnieta said, bazaar is held on yesterday and today. She ensures all commodities are sold below market price. "Various commodities in this bazaar are sold in affordable price. There are basic needs, clothing, shoes, and others," she mentioned. In this bazaar, 5 liters premium rice sold for Rp 55 thousand. Rice is also sold per packages. Package 1 contains of 900 ml super quality cooking oil, 2.5 kilogram long grain rice, one kilogram premium sugar, and one kilogram flour is sold for Rp 55 thousand. Package 2 is sold for Rp 75 thousand contains of five liters long grain rice, one kilogram sugar, flour, cooking oil, and fabric goodie bag. Package 3 is sold for Rp 100 thousand contains of 1.8 liters super quality cooking oil, five liters long grain rice, sugar, flour, and five instant noodles packages.